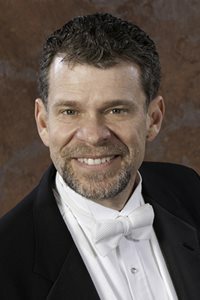 This year we are very excited to welcome David Harris, Director of the Raleigh Ringers, as our Clinician. In order to maximize our time with him, we will be concentrating on massed ringing rehearsal and not offer workshops. Dave will, however, be available for a discussion time with directors during the lunch hour. The program for the day will begin at 9:00 AM (set-up and registration at 8:15 AM.) The closing concert will be at 3:00 PM, featuring the massed ringing selections, as well as individual bell choirs, small ensembles, or solo ringers who would like to present a selection of music. David M. Harris has been the director of The Raleigh Ringers since January 1990, when he was instrumental in the formation of the group. The Raleigh Ringers is an internationally acclaimed, advanced community handbell choir based in Raleigh, North Carolina; and we had the excitement of having them featured at our Festival Conference. David studied music while earning a degree in computer science at the Pennsylvania State University and has received private instruction in conducting from Dr. William A. Payn of Bucknell University. David was the director of the handbell program at Hudson Memorial Presbyterian Church. He chaired the national committee that planned the very first Community/ Professional Handbell Choir event, Pinnacle 2000, which was held in Las Vegas, Nevada. Dave has selected the following pieces for the event. The first two are part of the 2019 Festival Conference repertoire, and the third is one which the Raleigh Ringers have recently recorded for the Lorenz demo. All three can also be used in your Lenten/Easter bell programs. Please purchase and begin rehearsing them before the Spring Ring. No meals are provided, but bottled water will be available. Please bring your own lunch and snacks. Each ensemble should designate one person, the Group Registrar, to register the group and themselves as well, if they will be attending. Participating ringers may register individually, or may register more than one ringer if they choose. (The membership number of the Director will be required, and should be used by all members of the ensemble.) The Group Registrar should note if your group is able to host any orphan ringers. Individuals who are attending without their group (“orphans”), please let us know if you would like to be hosted by another group, and what are your preferred bell positions.